Alex Rowe proved his versatility to win the first of the 4 race Fort Group Summer series. 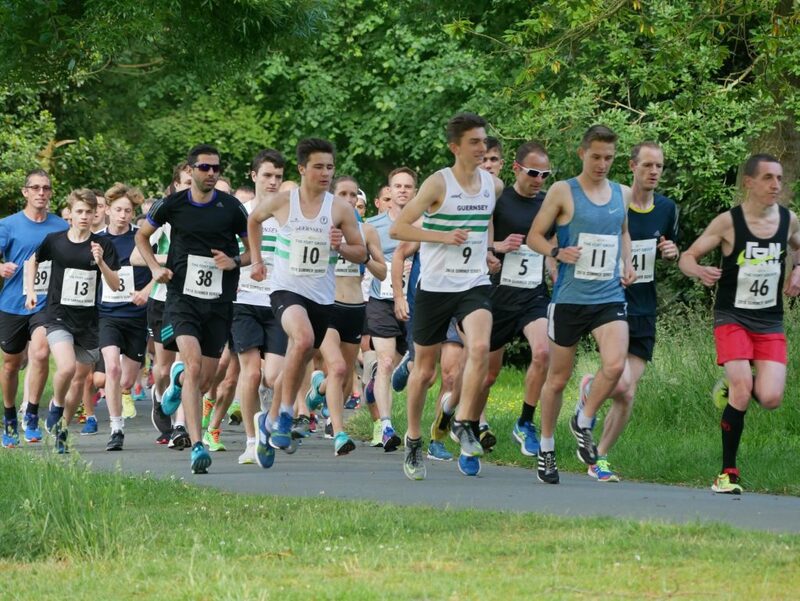 After posting a superb top 10 national ranking steeplechase performance only 5 days earlier he drew on his flat speed to hold off returning Bath student Dan Galpin over the four lap Saumarez Park 5k event. (Phil Nicolle’s image shows Rowe(no 9), James De Garis (5), Galpin (11), Carl Holden Part Hidden and Peter Amy ( 46) soon after the start). Galpin had led for much of the race but it looked like the writing was on the wall as Rowe hit the front in the last 600m and upped the pace. Drawing on his 800m speed the 18 year old was in full flight in the final 200m but it was to Galpin’s credit that he held the margin to only a few strides and crossed the line only 1 second behind Rowe’s 16:30 course PB. Third placed Pete Amy had doggedly tracked the leading duo through the race and was also rewarded a course PB of 16:40. Louise Perrio placed 12th of the 66 finishers to lead the women in and was joined on the podium by Magda Puzio and Laura Quayle who also ran a PB if 21 minutes 23 seconds. On a comfortably warm but still night the conditions were good and Jim De Garis, who has raced nearly every “5k in the Park” since its inception 9 years ago was another who ran a course best and more significantly dipped below 17 minutes for the first time. “First sub seventeen and its only taken me 50 attempts” he added with characteristically dry humour. Newcomers to Gsy Ac races further down the field also ran strongly with a good group being rewarded with their efforts by dipping just below the 30 minute barrier.